Popular media present a vast array of stories about women and men. What impact do these images and ideas have on people's identities?The new edition of Media, Gender and Identity is a highly readable introduction to the relationship between media and gender identities today. Fully revised and updated, including new case studies and a new chapter, it considers a wide range of research and provides new ways for thinking about the media's influence on gender and sexuality. 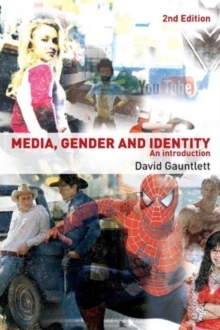 David Gauntlett discusses movies such as Knocked Up and Spiderman 3, men's and women's magazines, TV shows, self-help books, YouTube videos, and more, to show how the media play a role in the shaping of individual self-identities. The book includes:a comparison of gender representations in the past and today, from James Bond to Ugly Bettyan introduction to key theorists such as Judith Butler, Anthony Giddens and Michel Foucault an outline of creative approaches, where identities are explored with video, drawing, or Lego bricksa Companion Website with extra articles, interviews and selected links, at: www.theoryhead.com.